November last year Tim and I chatted about possibly moving abroad! What an adventure for the children, a new life of sunshine, beaches, lazy suppers in the garden! Where could we go? Not too far!! Wet and windy Somerset was home to us! Could we really up sticks and go!? No way! Not yet! Maybe in a few years! 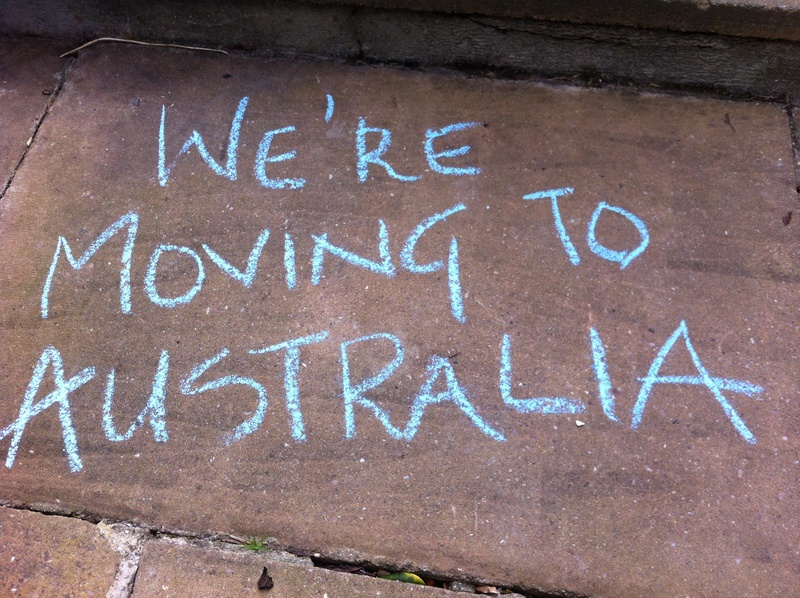 Well the visas are through, the house has been emptied, the ship has set sail, and we’re finishing up our goodbyes. The Wilson’s are on their way to Sydney! ( via pizza express for our last supper)! Check in opens at 1230 tomorrow and we’re hoping to get the roomiest seats! Doesn’t everyone do that? We are armed with bags of toys, colouring books galore, and plenty of dummies for Monty! Goodness only knows what will happen if we lose all twelve! But hey, we are well aware that 23 hours on a plane with two kids is never going to be a walk in the park! Next Farewells, luggage trolleys and a vomiting child!